Today I have an easy makeup tip/trick for you guys on how to make your perfume last longer! Apply a small amount of vaseline on to the spot(s) you wish to spray the perfume – normally on your wrist or on your neck & rub in. 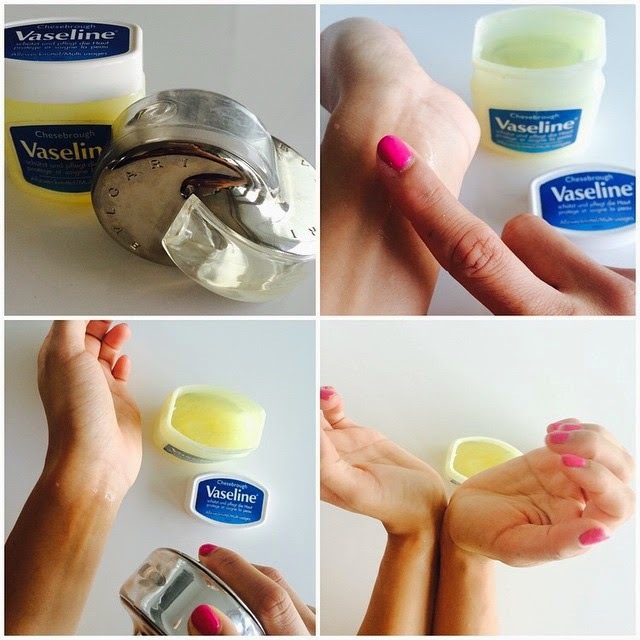 Spray the perfume once or twice on the vaseline. Rub wrists together or rub the spot where the vaseline & perfume are now merged. And that’s it! Your perfume should now last longer than it normally would. Hope you guys enjoyed this small yet helpful trick! * Pictures are not owned by me. ← “Fringe” Clothing + Bags/Accessories Trend?! I’ll have to try this out! Wonderful post! Thanks for this amazing tip!! Wow great tips. I will try them. I read this somewhere else recently too, will definitely give it a go! O.o *hallelujah course starts singing* I have to try this like now!!!! This is an amazing tip I have never heard of! That’s a great tip! I didn’t know that. Awesome, I so have to try this! Reblogged this on Vogue and Classy. We love this post ❤! Very nice trick! I will definitely try this the next time I go out!